Conor McGregor and Nate Diaz were involved in an expletive-strewn press conference on Wednesday as they intensified the verbal sparring ahead of their UFC 196 bout in March. Wednesday's news conference at the UFC Gym on the outskirts of Los Angeles was a spiky affair, with McGregor predicting a quick victory, while Diaz randomly threw out allegations of steroid use ahead of their non-title fight at UFC 196 on March 5. Diaz agreed to step in as a last minute replacement for injured UFC lightweight champion Rafael dos Anjos and McGregor says it's a decision he will regret. "His soft body and his lack of preparation, he will not be able to handle the ferocity. End of the first I feel he will be put away," said the featherweight title-holder. McGregor had been hoping to make history against Dos Anjos by becoming the first fighter to hold titles in multiple weight classes at the same time. The Brazilian's withdrawal has seen McGregor move up two weight classes to 170-pounds for the bout against Diaz, and he was angered when his opponent claimed everyone in the UFC is on steroids. McGregor said: "Steroids? What are you talking about steroids? Don't be putting my name with steroids. I'm major against that. Don't put my name in the name of steroids, Nate." 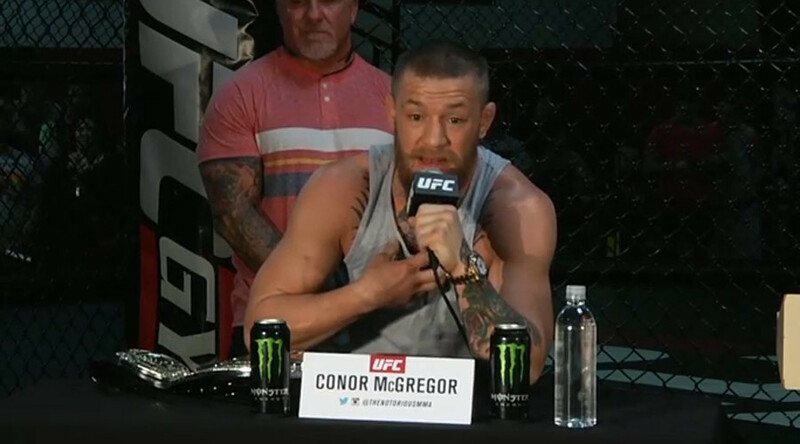 "I feel his body will be ripped to shreds," added McGregor. "It's a soft frame. The left uppercut will be a nice one. His long range is an illusion. The left uppercut will ping him clean." He also found time to criticize Dos Anjos for his late withdrawal. "Dos Anjos has a bruise on his foot - did ya see it?" he asked. "It's a bruise. Ice. Ibuprofen. If I jumped under an X-ray, the doctor would slap me and say: 'What are you doing, kid? Get out of here! Stop this.'" While McGregor did what he does best by dominating the news conference, Diaz managed the odd sharp reply, including one suggestion that he'd been fighting “grown-ups” while the Irishman had been cherry-picking undersized opponents. He was also quick to remind everyone that there was more than one fighter involved in the contest. "I bring this show, too," Diaz said. "It's the Diaz show, too. So don't forget about that." Highlights of the press conference are below (WARNING: VERY STRONG LANGUAGE). McGregor continued the verbal sparring on Twitter, although UFC bosses may take a dim view of his choice of words after he used an anti-Mexican slur against Diaz.